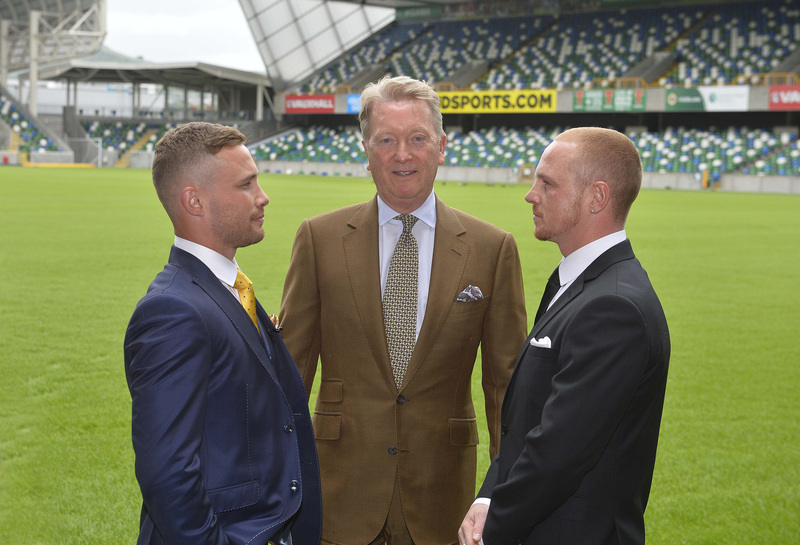 Former two-division world champion Carl Frampton knocked out Luke Jackson to retain his interim featherweight title Saturday at Windsor Park in Belfast in a doubleheader that streamed live on SHOWTIME Sports social platforms. In the opening bout of SHOWTIME BOXING INTERNATIONAL, lineal heavyweight champion Tyson Fury shut out Francesco Pianeta to line up a 2018 showdown with WBC Heavyweight World Champion Deontay Wilder. An encore presentation will air in primetime tonight at 10 p.m. ET/PT on SHOWTIME EXTREME®. Frampton (26-1, 15 KOs) turned in an impressive performance and scored his first knockout as a featherweight in what was a “dream” homecoming fight at the home of Northern Irish football. The former 126 and 122-pound champion now has his sights set at becoming a champion yet again in one of boxing’s deepest divisions. After a dominant seven rounds, Frampton scored a knockdown via a body shot with 30 seconds left in the eighth. Jackson (16-1, 7 KOs) survived the eighth but was clearly hurt. With Jackson absorbing continued punishment in the ninth, and down big on the scorecards, Jackson’s corner threw in the towel at 1:21. Fury (27-0, 19 KOs) established his jab against Pianeta (35-5-1, 21 KOs) and displayed the movement, hand speed and footwork that a prime “Gypsy King” utilized to dethrone Wladimir Klitschko in 2015 to become the unified and lineal heavyweight champion. “I think it was a calculated boxing performance, as promised,” said Fury, who was fighting for just the second time in nearly three years. “We were able to get 10 good rounds in with a tough man. I was working on my boxing, trying to slip and slide, use the jab and get the rounds in. I was very happy with the performance. After the fight, Wilder entered the ring to announce that the two undefeated heavyweights have agreed to a 2018 showdown for Wilder’s WBC title. A date and venue for the event, which will be produced and distributed by SHOWTIME PPV, will be announced shortly. “We’re ready now,” Wilder said during the post-fight interview. “This fight will happen. It’s on. This fight is official. This is what we’ve been waiting for, the best fighting the best. The 6-foot-9 Fury, who never lost his titles in the ring, will now face the 6-foot-7 Wilder, who has 39 knockouts in his 40 professional fights. “We are two men who will fight anybody,” Fury said. “This man has been trying to make a big fight with the other chump, I think we all know who I’m talking about. They called, I answered. I said to send the contract, they sent me the contract. I said yes. And now he gets his chance to fight the linear heavyweight champion of the world. Showtime Networks Inc. (SNI), a wholly-owned subsidiary of CBS Corporation, owns and operates the premium television networks SHOWTIME®, THE MOVIE CHANNEL™ and FLIX®, and also offers SHOWTIME ON DEMAND®, THE MOVIE CHANNEL™ ON DEMAND and FLIX ON DEMAND®, and the network’s authentication service SHOWTIME ANYTIME®. Showtime Digital Inc., a wholly-owned subsidiary of SNI, operates the stand-alone streaming service SHOWTIME®. SHOWTIME is currently available to subscribers via cable, DBS and telco providers, and as a stand-alone streaming service through Amazon, Apple®, Google, LG Smart TVs, Oculus Go, Roku®, Samsung and Xbox One. Consumers can also subscribe to SHOWTIME via Amazon’s Prime Video Channels, DirecTV Now, FuboTV, Hulu, Sling TV, Sony PlayStation™ Vue, and YouTube TV. SNI also manages Smithsonian Networks™, a joint venture between SNI and the Smithsonian Institution, which offers Smithsonian Channel™, and offers Smithsonian Earth™ through SN Digital LLC. SNI markets and distributes sports and entertainment events for exhibition to subscribers on a pay-per-view basis through SHOWTIME PPV. For more information, go to www.SHO.com.